The Microsoft Dynamics Lifecycle Services team is happy to announce the immediate availability of Dynamics AX Platform version 7.2 (August 2016). Starting today you can deploy Dynamics AX Platform version 7.2 from LCS. Platform version 7.2 will be deployed using Azure Resource Manager technology (ARM) therefore, you will have to set up LCS Azure connectors which are ARM enabled. You can find details on how to set up ARM enabled connectors in the wiki topic, Azure Resource Manager onboarding (http://ax.help.dynamics.com/en/wiki/arm-onboarding/). In the Partner project workspace, after you select the topology you want to deploy, you can select from RTW, May 2016 Update (Update 1), or August 2016 Update (Update 2). To learn more about what’s new in this release, see What’s new or changed in Dynamics AX platform version 7.2 (August 2016). In the Implementation project, after you click Configure, you will be provided with an option to choose from RTW, May 2016 Update (Update 1), or August 2016 Update (Update 2). 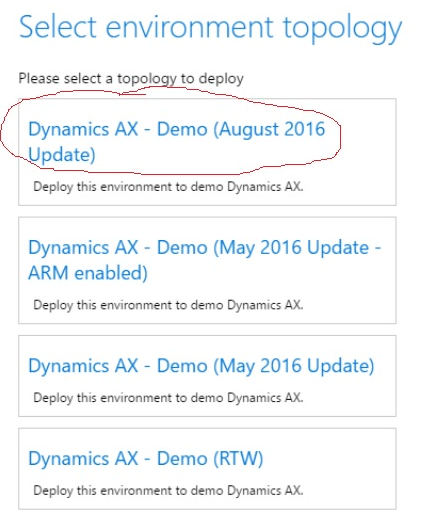 If you want to deploy the most recent platform update, select Dynamics AX – Develop (August 2016 Update), as shown below. This will load a specific deployment configuration screen for you. 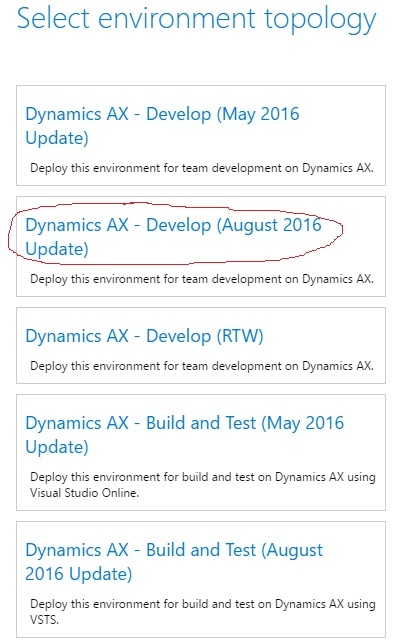 You can also update your existing environments to the new Dynamics AX platform. The package is available in the Shared Asset Library in LCS, accessed by the tile on the main LCS landing page. Instructions for deploying this package are available here. The LCS code upgrade tool will now upgrade your Dynamics AX source code and metadata to the latest platform update, Dynamics AX Platform version 7.2 (August 2016), and the latest application update (May 2016). Customers on Dynamics AX Platform version 7.2 (August 2016) will see relevant updates/hotfixes on their platform environment. The experience will be same as the May 2016 update experience. Customers and partners will be able to update their environments (Demo, Sandbox, and Production) with customizations and hotfixes directly through LCS without having to remote into any environment to run through the update steps manually. On the Demo and Sandbox environments, this flow is self-serve and you can automatically apply updates through LCS; while Production LCS provides a flow to submit a request to apply package through LCS and Microsoft Service Engineering team is responsible for applying the update. For more information, see the wiki topic, Apply a deployable package on a Dynamics AX system (https://ax.help.dynamics.com/en/wiki/apply-a-deployable-package-on-a-dynamics-ax-system/). Customers and partners can perform advanced SQL diagnostics using the SQL Now and Index Usage tools added in LCS. The SQL Now feature gives the ability to troubleshoot SQL issues in real time by looking into what queries are blocked and which queries are blocking them. It also provides a view in tables that have locks on them. The Index Usage view shows the most expensive indices on the environment based on seeks vs. scans along tables with the highest row count.